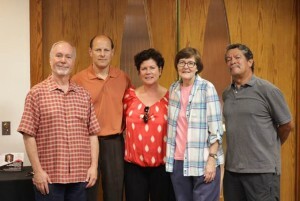 Duran’s friends and family gather for a picture at the TCC Dedication.From left to right, Duran’s husband, Rick Nupoll; her brother-in-law Scott Lyons; her sister Mary Grace Duran; TCC Librarian Mara Houdyshell and Armand Duran, her brother. Photo by Joshua Valle. The Teacher Curriculum Center (TCC)‘s collection in California State University, Northridge’s Delmar T. Oviatt Library has long served as a resource for teachers throughout the region, providing them with sometimes hard to get teaching materials for learning levels ranging from pre-kindergarten to 12th grade. Last month, the center’s collection was renamed after the late Karin J. Duran, who served as the center’s director for 32 years before passing away in 2010. Her husband Rick Nupoll said it was fitting to name the center’s collection after his wife, a CSUN alumna who dedicated her time at the university to making sure teachers who often have little, if any, budget for classroom resources knew they had a place to go for help at the Oviatt Library. The center was established in 1978 — then called the Instructional Materials Laboratory—as a resource for many students studying to be teachers at the university. During her tenure, Duran nurtured it into a valuable resource that not only provides support to CSUN’s education students, but also to teachers in classrooms throughout the region. The center is located in the basement of the Oviatt Library, and the collection features more than 26,000 resources available to be used in the classroom, from textbooks and idea books to educational kits and games. There are even videos and supplemental teaching materials available. Materials are offered in various print and electronic formats. Library officials estimate that an average of 1,271 people use the center each week. The center is open Monday through Thursday from 8 a.m. to 11:45 p.m., on Friday from 8 a.m. to 4:45 p.m., on Saturday from 11 a.m. to 4:45 p.m. and on Sunday from noon to 7:45 p.m.
For more information about the Karin J. Duran collection, call (818) 677-2638.